This is the story of a historical marker without much of a history. 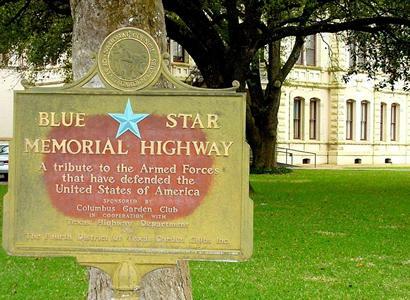 Twenty-five years ago, the Texas Garden Clubs, Inc. of Texas embarked on a mission to dedicate a series of Blue Star Memorial Highways as a means of honoring the services of men and women who served in the U.S. armed forces during World War II. 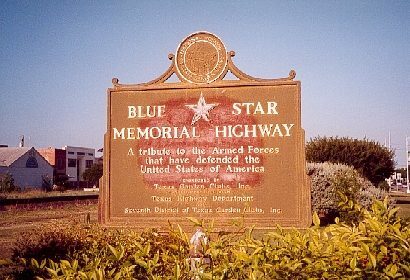 At the request of garden clubs throughout the state, the Texas Highway Department in 1976 designated eight highway sections as Blue Star Memorial routes. Large metal markers bearing the Blue Star symbol were placed along the roadsides of each segment. The program was actually a national campaign inaugurated by the National Council of State Garden Clubs and may have been started in Texas as early as 1947 because one highway was designated by state officials then and modified in 1953. Another was set aside in 1975. But over the span of five decades, the story behind these historical markers has been lost in the mists of history. Our interest in the Blue Star Memorial Highways was aroused when a friend called with a request for information about "the Blue Star marker on U.S. 59 near the Highway Department" in Lufkin. She said she had checked a number of local historical sources, but found little information. For a while, we also ran into a brick wall. Our old reliable resource, the Handbook of Texas and its online companion, made no mention of the designations. Calls to libraries and a couple of East Texas historians produced little or no information. Then, we did what we should have done in the first place. We called Cathy White, the community relations representative of the Lufkin office of the Texas Department of Transportation. In a few days, Cathy solved at least a portion of the mystery. On May 4, 1976, the Texas Department of Highways approved a minute order in Austin granting the Texas Garden Clubs� request to designate the memorial highways and agreed to erect Blue Star markers provided by the garden club ladies. U.S. 287 from the Anderson-Houston county line to the Johnson-Ellis county line (1976). U.S. 385 from Big Bend National Park north to the Oklahoma state line north of Dalhart (1976). U.S. 77 from the Oklahoma state line at Gainesville to Denton, then via other highways the New Mexico state line (1947 and 1953). Some portions of the history of the Blue Star Memorial Highways remain unknown. Where did the name Blue Star originate? How, when and where did the designation program begin? How many markers were erected in Texas and the U.S.? How many highways were marked in the U.S. If you can help us better define the history of these old historical markers, let us know. Bob Bowman is a former president of the East Texas Historical Association and the author of 24 books on East Texas history and folklore. I'm a member of the Nassau Bay, Texas, Garden Club, as well as Blue Star Memorial Highway chairman for District IV, Texas Garden Clubs Inc. No doubt much of the info you have been given regarding the Blue Star project is correct, but the info from TXDoT is off on dates. Our club dedicated NASA Road One as a Blue Star Memorial Highway in 1971. It included the official marker, the one that is still used today. While I may not have as much history on Texas' Blue Star, I do have an overall history covering the national, as well as a list of the 52 Texas highways that have been dedicated. On March 1, 2003 our club "rededicated" its marker due to the fact that TXDoT somehow moved our marker from its original location without notifying anyone. When I moved to Nassau Bay in 1991 and joined the garden club, someone mentioned that our club had installed the marker and planted oleanders down NASA Road 1. When I asked about the marker, no one knew where it was. So, we began a search and located it in another town where TXDoT had put it next to a historical marker. We got permission to remove it and put it in Nassau Bay (it first had been on the Johnson Space Center [NASA] side of the road).